“If you don’t need it. DON’T BUY IT” – a rather “foreign concept in today’s society” (Sexton), but a well-known one among all Americans during the 1940s as it was seen on every single ration booklet. This slogan had a great impact on the mindset of the people back then, as it forced them to conserve rather than splurge during this crucial time when the USA became involved in World War II. 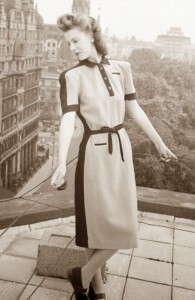 This initiated a drastic change in the country which reflected itself through fashion in particular because materials and factories used for clothing all became associated with military purposes, thereby forcing the overall look of fashion.In addition, the end of the war did not stop the styles from changing but actually introduced a new look for the upcoming years. Hence, the focus question of this essay is: How were the styles of women’s fashion in the United States influenced by World War II during the 1940s? The war had a major impact on the United States since it lasted nearly half of the decade from 1941 to 1945. It has also proven to be significant as it had an effect on fashion after the war ended as “Feminine luxury and elegance became the symbol of post-war prosperity and defined the silhouette for the coming decade” (Walford). Even though it was an unsteady time period for the United States’ garment industry, it has proven to have been a positive influence towards sparking a new fashion era accredited to Christian Dior’s ‘New Look’. Furthermore, it has shown that regardless of limitations, new styles were still able to be produced during the wartime.